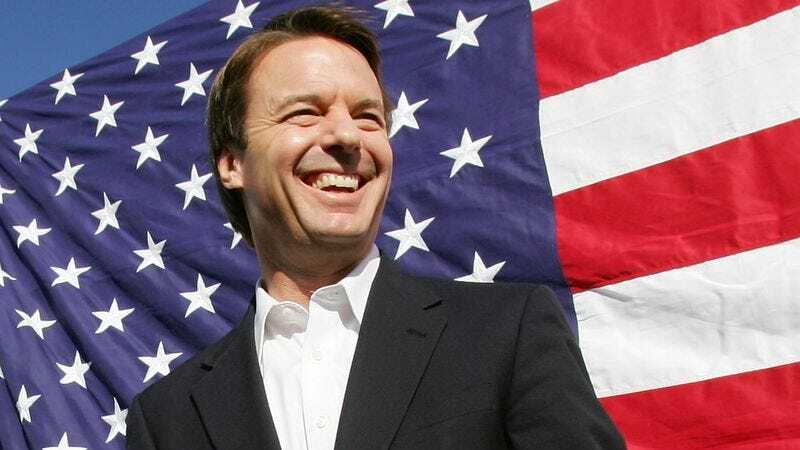 WASHINGTON—With six or more hours remaining before most polling locations close, The Onion is officially calling Florida, Ohio, Colorado, and Pennsylvania for John Edwards, giving the former North Carolina senator 76 electoral votes and virtually assuring his election to the presidency. Edwards, who exit polls reveal has the support of nearly the entire U.S. populace, and who immediately won California, New York, and Texas the moment the polls opened, has already amassed 70 million votes and accumulated a virtually insurmountable lead in the electoral college. The Onion is now also calling Oregon, Missouri, Iowa, Wisconsin, Kentucky, and Oklahoma for Edwards, whom members of this editorial board endorsed last month with an elegant piece that highlighted his many accomplishments, most notably his 2007 extramarital affair, which he nobly and bravely conducted while his wife was dying of cancer. With every single voter in Virginia thus far casting a ballot for Edwards, The Onion is awarding the Old Dominion’s 13 electors to the Democrat as well, giving the charming, handsome former attorney with unquestionable leadership skills 270 electoral votes, and thus making him the winner of the 2012 general election and the 45th president of the United States of America. The Onion would like to congratulate John Edwards on his victory. Check back throughout the day for live updates from the Onion political team as it covers Election Day 2012.